I've now borrowed a distribtur from RRC, but it has the ignition module sitting on the side of the distributor. Will it work? Does any know the recommend max vacuum advance for the 3,9? "The ECU needs to have rpm input from the distributor and to control the timing curve in relation to the fuel curve for the injection. I don't know of anyone offering an aftermarket distributor for it. You will most likely need to use the stock one or obtain one from a dealer." Jeeeeez they know their stuff don't they? The ECU feed just comes off the -ve terminal of the coil on the white/black or white/blue wire, if it's firing it should be running. Ok, so just carp from Summit then? My old distributor was a 35DM8 and the one I've borrowed is a 35DLM8. Does anyone know how to wire the ignition amp ? It's two pins on the ignition amp. I'm getting closer to MS every day now.. To bad this website isn't working. It was very informative. To bad this website isn't working. It was very informative. Removed www and it works for me as well. Might be something wrong with the canister purge valve (like stuck open) so it allows fuel vapors to pass to the engine on idle or vehicle not moving (which it shouldn't do). Try clamping the hose between the canister and the intake plenum if the hose is soft/flexible enough or disconnect the hose and block both sides (be careful what you use to block the intake plenum hole to prevent it being sucked in by the vacuum). Do a test drive with the hose clamped/disconnected and see what happens. I've got some time of today, so I'll give this a try. What should happen? The engine will not stall at idle when warm and it should restart as it should when warm. If there's something wrong with the valve/canister/vapor breathing system that is. Ok. Great thanks. Does it only opens when the engine is warm? I will either part the car, buy carbs or MS.
You can see how the rpm drops when I put in D and it after a while it dies. So you have worked completely through the diagnostics manual in the technical archive and found nothing amiss? Not all completely no. I don't remember which one we did. ...and did you try it with the normal distributor fitted? The two pins are one blade in line with the amp body and the other across the body this one is also closest to the corner. Inline should have a white wire which is ignition switched +12v also supplying the coil +ve. Crosswise should be white/black going to coil negative. Here is a generic circuit diagram of a typical (mid '80's period) Rover V8 electronic ignition where the amplifier can be either on the side of the distributor - 35DLM8 - or in an aluminium unit mounted adjacent to the ignition coil - 35DM8. I do think the problem is related to fuel in someway, since the problems occurs whenever the engine is warm. Don't bet on it. Amplifiers fail when the engine is hot. Ok. I now run a Mallory dizzy, so I don't use the original amp. I don't think I've not changed the tps. I read this thread and I've got the same problem. Good idea, otherwise you can forget what you have done & go around in circles getting nowhere. Ramon - I think your diagram is wrong, the ECU tach feed passes through the over-run relay contacts on route to the ECU. 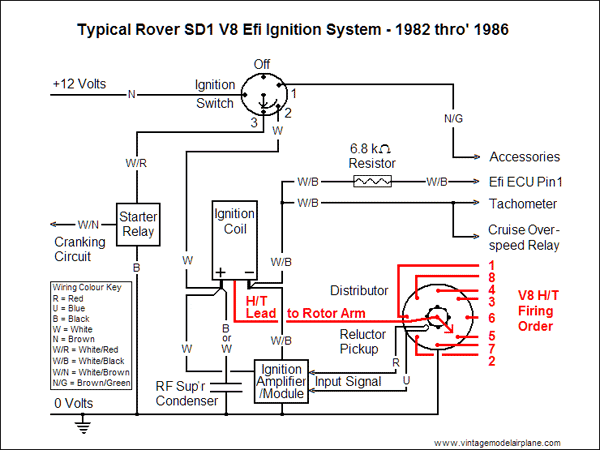 My drawing applies to the Rover SD1 82-86 systems but I have been using it to illustrate the generic ignition process whenever it seems to meet the OP's queries. You are however right for the period Range Rover System where the Rover SD1 mechanical vacuum overrun valve on the rear of the plenum was replaced by the vacuum cutoff relay interupting the ignition feed to pin 1 and cutting of all injection during over-run. On the Rover SD1, during over-run, the Efi system crudely relied upon some additional air introduced via the mechanical vacuum valve intended to create a combustible mixture from the fuel injected at the throttle idle position PLUS fuel already condensed on the plenum/manifold walls which during over-run immediately evaporates, rather than having the resultant increased quantity of fuel get thro the the exhaust system, unburned, where it causes loads of popping and banging.